U.S. Debt, the value of the securities markets and Household Net Worth do grow to the sky. The Fed’s latest Z.1 report documents another quarter of inflating Credit, markets and perceived wealth – three additional months of history’s greatest Bubble. Total (non-financial and financial) U.S. System borrowings jumped a nominal $495 billion during the quarter and $2.630 TN in 2017 to a record $68.591 TN. Total Non-Financial Debt (NFD) expanded at a seasonally-adjusted and annualized rate (SAAR) of $1.407 TN during 2017’s fourth quarter to a record $49.050 TN (’17 growth of $1.793 TN). Credit growth slowed from Q3’s SAAR $3.007 TN and Q2’s SAAR $1.921 TN, while it was closely in line with Q4 2016’s SAAR $1.435 TN. NFD as a percentage of GDP ended 2017 at 249%. This compares to 230% to end 2007 and 179% in 1999. By major category for the quarter, Household Debt expanded SAAR $790 billion, a notable acceleration from Q3’s $516 billion and Q2’s $573 billion. For perspective, one must go back to 2007’s $946 billion to see annual growth exceeding Q4’s pace of Household borrowings. For 2017, total Household Borrowings expanded $604 billion, up from 2016’s $510 billion, ‘15’s $403 billion, ‘14’s $402 billion, ‘13’s $241 billion, and ‘12’s $266 billion. Household Borrowings contracted $51 billion in ’11 and $61 billion in ’10. And while Household Mortgage borrowings increased to SAAR $302 billion (from Q3’s $282bn), the surge in Household Borrowings was led by a record SAAR $292 billion jump in (non-mortgage) Consumer Credit. Consumer Credit rose SAAR $134 billion in Q3 and SAAR $229 billion in Q4 2016. It’s worth noting that Consumer Credit growth posted its previous cycle peak at $181 billion in Q3 2007. Total Corporate Credit growth slowed markedly during Q4 to SAAR $520 billion, down from Q3’s SAAR $840 billion, Q2’s $808 billion and Q1’s $815 billion – but was ahead of Q4 ‘16’s $314 billion. Total Corporate Borrowings expanded $746 billion in 2017, up from ‘16’s $710 billion but below ‘15’s $819 billion. Federal government borrowings slowed sharply during the fourth quarter, with massive debt issuance pushed into Q1 ’18. For calendar year 2017, federal borrowings dropped to $447 billion from ‘16’s $843 billion. 2018 federal borrowings will be enormous. On a percentage basis, Non-Financial Debt growth slowed to 3.8% in 2017, down from ‘16’s 4.6%. But this slowdown was chiefly related to a halving of the growth in federal borrowings to 2.8% from 5.6%. Household Debt expanded at a 4.1% pace, up from ‘16’s 3.6% to the strongest growth since 2007’s 7.1%. The Domestic Financial Sector expanded nominal $1.832 TN during the quarter to a record $97.041 TN. During the quarter, Agency/GSE securities gained SAAR $302 billion, Corporate & Foreign Bonds SAAR $517 billion, Fed Funds & Repo SAAR $486 billion and Loans SAAR $898 billion. Bank (Private Depository Institutions) Assets increased nominal $204 billion, or 4.4% annualized, during Q4 to a record $18.925 TN. Bank Loans jumped nominal $167 billion, or 6.3% annualized, to $10.776 TN. Bank Assets were up $852 billion in 2017 (4.5%), an increase from 2016’s $712 billion (3.9%). From a more conventional perspective, growth in U.S. “money” and Credit doesn’t appear all that remarkable. Yet asset-based lending has quietly gained significant momentum. Total Mortgage Credit jumped $573 billion in 2017 (Q4 SAAR $625bn), the strongest expansion since 2007. Q4 multifamily mortgage growth was the strongest in years. Agency Securities gained nominal $337 billion (3.9%) in 2017 to a record $8.857 TN, with a two-year gain of $688 billion. It’s anything but clear why the GSEs should be growing rapidly at this point. Broker/Dealer Assets jumped nominal $116 billion during Q4 (15% annualized) to $2.229 TN, an almost three-year high. Broker/Dealer assets expanded $206 billion in 2017, the largest expansion since 2010’s $235 billion. Exchange-traded Funds (ETF) expanded $263 billion during Q4 to $3.400 TN. ETFs expanded $876 billion, or 34.7% in 2017, with a two-year gain of $1.300 TN, or 62%. After beginning 2008 at $6.051 Trillion (42% of GDP), Treasury Securities ended 2017 at $16.431 TN (83% of GDP). Treasury and Agency Securities combined for $25.288 TN, or 128% of GDP. It’s a staggering amount of so-called “risk free” securities underpinning the entire financial system. Also “staggering” and “underpinning,” global finance pouring into U.S. securities markets is unrelenting. It's become a primary source of fuel sustaining the Bubble. Rest of World (ROW) increased holdings of U.S. financial assets by a nominal $646 billion during Q4. For perspective, this is more than triple the Q4 expansion of bank loans. This put 2017 ROW growth at a record $2.817 TN, up from ‘16’s $1.182 TN and surpassing ‘13’s $2.174 TN and ‘06’s $2.125 TN. ROW now holds a record $11.456 TN of U.S. debt securities, $7.888 TN of equites and mutual funds, $737 billion of Repos and $4.699 TN of Foreign Direct Investment. Since the end of 2008, ROW holdings have increased $13.342 TN, or 97%, to end 2017 at a record $27.042 TN. ROW holdings began the nineties at $1.738 TN and ended that decade at $5.621 TN. Total outstanding Debt Securities (TDS) expanded nominal $441 billion during Q4 to a record $42.826 TN. TDS gained $1.537 TN in 2017, after increasing $1.543 TN in ’16. TDS has increased $11.88 TN, or 38%, since the end of 2008. TDS as a percent of GDP remained constant during Q4 at 217%, after ending 2007 at 200%. Total Equities Securities (TES) jumped $2.285 TN during Q4 to a record $45.825 TN. TES rose $7.403 TN during 2017, or 19.3%. Since the end of ’08, TES has surged $30.587 TN, or 201%. As a percentage of GDP, TES ended 2017 at a record 232%. This compares to cycle peaks 181% to end Q3 ’07 and 202% during Q1 2000. It’s worth mentioning as well that TES as a percentage of GDP didn’t recover to 100% until Q3 ’95 (106% in 1968). TES as a percentage of GDP ended 1970 at 77%, 1975 at 50%, 1980 at 52%, 1985 at 52%, and 1990 at 59%. Total (Debt and Equities) Securities ended 2017 at a record $88.651 TN. Total Securities surged to a record 449% of GDP, up from 429% to conclude 2016. For perspective, Total Securities to GDP peaked at 379% ($55.3TN) during Q3 2007 and 359% ($36.0TN) at cycle highs in Q1 2000. Total Securities as a percent of GDP ended 1970 at 148%, 1975 at 122%, 1980 at 128%, 1985 at 155%, 1990 at 189%, and 1995 at 262%. Massive inflows of international finance have been integral to the U.S. securities market Bubble. Inflating securities and asset prices have inflated perceived household wealth, a dynamic fundamental to the U.S. Bubble Economy. Household Assets jumped nominal $2.284 TN during Q4 to a record $114.395 TN, with a one-year gain of $7.760 TN and two-year rise of $13.514 TN. For the quarter, Real Estate increased $511 billion to a record $27.848 TN. Financial Assets jumped $1.699 TN in Q4 to a record $80.395 TN, with total equities up $972 billion to $26.562 TN. With Household Liabilities up $209 billion to $15.650 TN, Household Net Worth jumped $2.076 TN during the quarter to a record $98.746 TN. Household Net Worth inflated $7.162 TN during 2017 to a record 500% of GDP. For comparison, Net Worth to GDP ended 2007 at 459% and 1999 at 445%. Net Worth to GDP ended 1970 at 357%, 1975 at 342%, 1980 at 359%, 1985 at 350%, 1990 at 367% and 1995 at 381%. I define a Bubble as a self-reinforcing but inevitably unsustainable inflation. Household Net Worth at 500% of GDP is not sustainable. I believe it is unsustainable because I don’t believe Total Securities at 449% of GDP is sustainable. And current securities values are unsustainable because the current financial structure is not sustainable. Too large a percentage of new Credit creation is financing overvalued assets (securities and real estate, in particular), leaving this key source of liquidity vulnerable to asset price reversals. Too much of the new Credit is Treasury and government-related securities that are grossly mispriced in the marketplace. Moreover, enormous foreign-sourced inflows are having a major (if unappreciated) impact on marketplace liquidity. I suspect that a significant portion of these inflows are related to global QE and, somewhat less directly, to speculative leveraging (“carry trades,” etc.). These sources of liquidity are increasingly vulnerable to central bank “normalization,” higher funding costs and rising global yields. Over half of all public firms have disappeared over the last twenty years. We’ve seen a collapse of publicly listed companies. Astonishingly, according to a study by Credit Suisse, “between 1996 and 2016, the number of publicly-listed stocks in the U.S. fell by roughly 50%â—âfrom more than 7,300 to fewer than 3,600â—âwhile rising by about 50% in other developed nations.”(i) It is not lower growth or the global Financial Crisis that caused fewer IPOs. This is distinctly an American phenomenon. The decline in listed companies has been so spectacular that the number lower is than it was in the early 1970s, when the real GDP in the US was just one third of what it is today. (ii) America’s economy grows ever year, but the number of listed companies shrinks. On this trend, by 2070 we will only have one company per industry. Large parts of America are dominated by monopsonies. 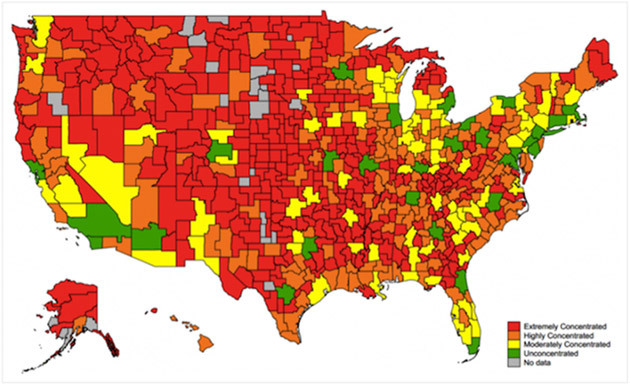 In a comprehensive study, Marshall Steinbaum, Ioana Marinescu, and Jose Azar looked across all industries and commuting zones in the US to measure how concentrated employers were. They found that most labor markets are very concentrated and that it has a strong negative impact on posted wages for job openings. 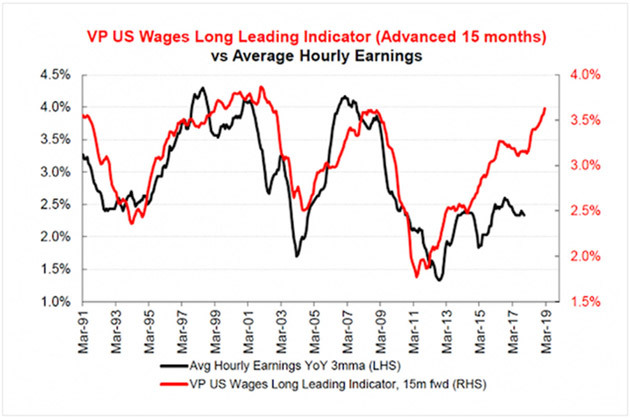 (v) They showed that going from a very competitive to a highly concentrated job market is associated with a 15-25% decline in wages. A great divide formed between rural and metropolitan areas in the US. In 1980, if you lived in Washington D.C., your per-capita income was 29 percent above the average American; in 2013 you would be 68 percent above. In New York City, the income was 80 percent above the national average in 1980 and skyrocketed to 172 percent above by 2013. 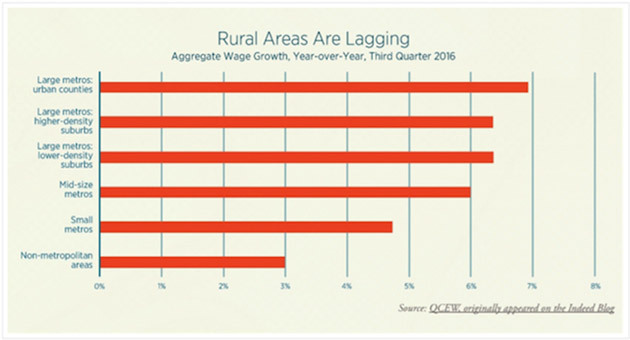 (vii) Power and money began concentrating in urban centers across the country as a rural ‘brain drain’ occurred. 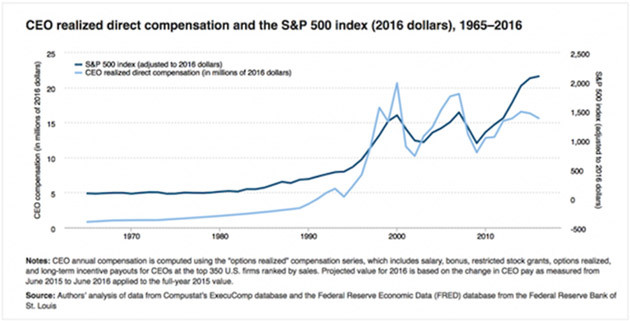 In the US CEO pay has exploded. 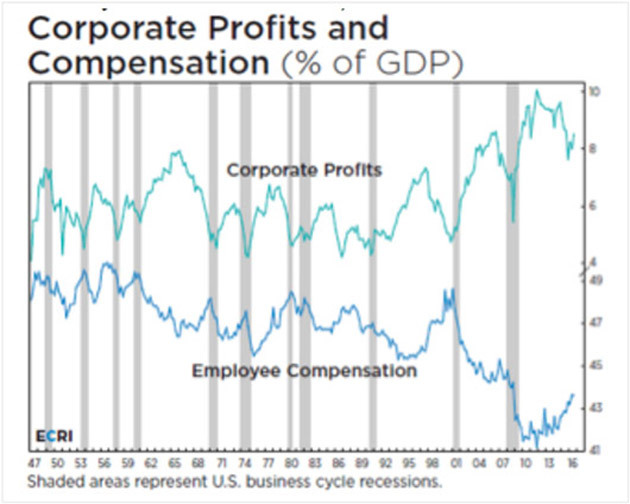 From 1978 to 2013, CEO compensation adjusted for inflation increased 937%. 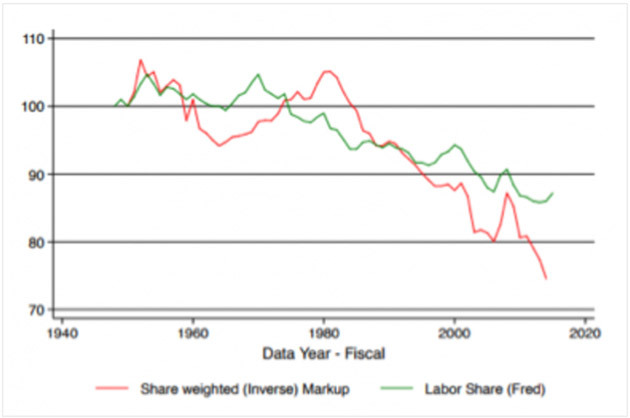 By contrast, the average worker’s income grew by a pathetic 10% over the same period. 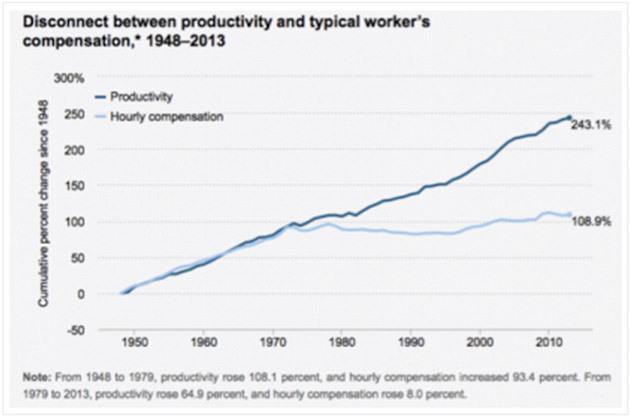 To put the change in perspective, the CEO-to-worker pay ratio was 33-to-1 in 1978 and grew to 276-to-1 in 2015. 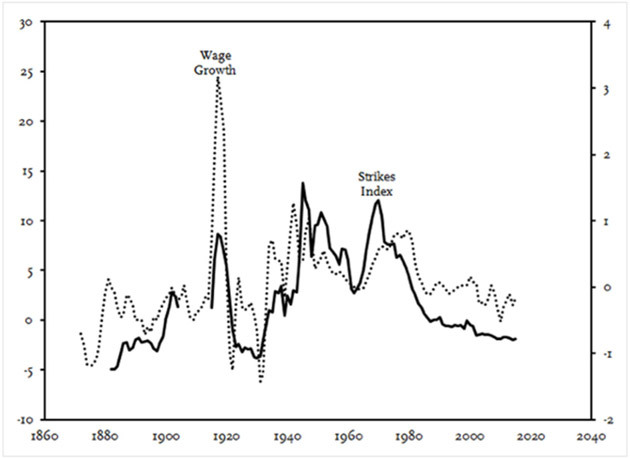 (viii) The US is a big outlier in terms of how vastly overpaid the top corporate officers are vs the average worker. For CEOs in the UK, the ratio is 22; in France, it’s 15; and in Germany it’s 12. (ix) US CEOs are vastly overpaid no matter how you look at it. 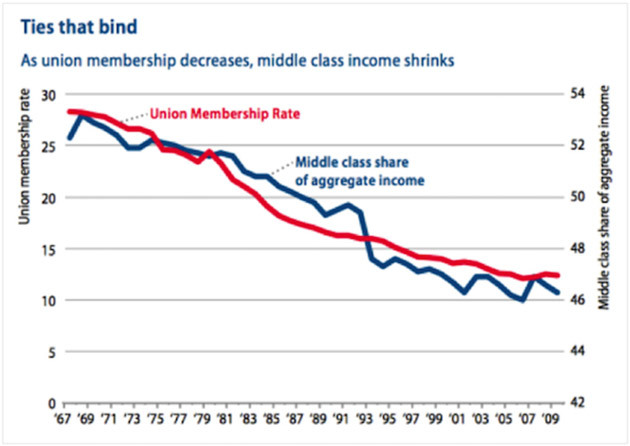 Unions maintained an important part in American working life for decades, but then declined again. In 1983, about 1 in 5 Americans were part of a union; today, only 6.4% of private sector workers in America are unionized and less than 11% of total workers. 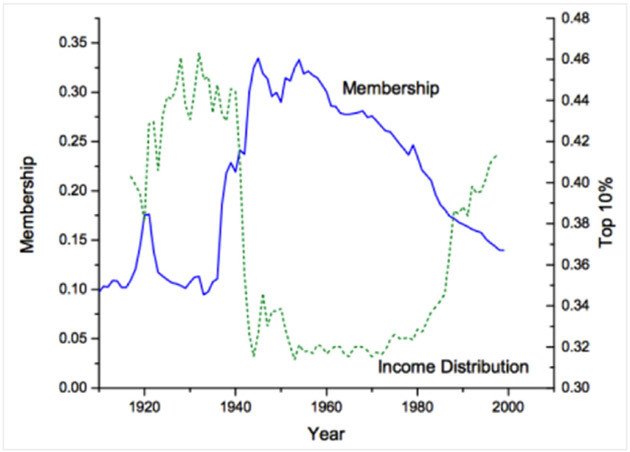 (x) This represents a considerable decline in the ability of workers to organize. Unions, though controversial, provided a needed forum for workers to band together and advocate for their collective rights. After the collapse of the Soviet Union, the West welcomed the next big communist country into the global economic order. Western leaders believed that giving China a stake in institutions such as the World Trade Organisation (WTO) would bind it into the rules-based system set up after the second world war (see Briefing). They hoped that economic integration would encourage China to evolve into a market economy and that, as they grew wealthier, its people would come to yearn for democratic freedoms, rights and the rule of law. It was a worthy vision, which this newspaper shared, and better than shutting China out. China has grown rich beyond anybody’s imagining. Under the leadership of Hu Jintao, you could still picture the bet paying off. When Mr Xi took power five years ago China was rife with speculation that he would move towards constitutional rule. Today the illusion has been shattered. In reality, Mr Xi has steered politics and economics towards repression, state control and confrontation. Start with politics. Mr Xi has used his power to reassert the dominance of the Communist Party and of his own position within it. As part of a campaign against corruption, he has purged potential rivals. He has executed a sweeping reorganisation of the People’s Liberation Army (PLA), partly to ensure its loyalty to the party, and to him personally. He has imprisoned free-thinking lawyers and stamped out criticism of the party and the government in the media and online. Though people’s personal lives remain relatively free, he is creating a surveillance state to monitor discontent and deviance. China used to profess no interest in how other countries run themselves, so long as it was left alone. Increasingly, however, it holds its authoritarian system up as a rival to liberal democracy. At the party’s 19th congress last autumn, Mr Xi offered “a new option for other countries” that would involve “Chinese wisdom and a Chinese approach to solving the problems facing mankind.” Mr Xi later said that China would not export its model, but you sense that America now has not just an economic rival, but an ideological one, too. The bet to embed markets has been more successful. China has been integrated into the global economy. It is the world’s biggest exporter, with over 13% of the total. It is enterprising and resourceful, and home to 12 of the world’s 100 most valuable listed companies. It has created extraordinary prosperity, for itself and those who have done business with it. Yet China is not a market economy and, on its present course, never will be. Instead, it increasingly controls business as an arm of state power. It sees a vast range of industries as strategic. Its “Made in China 2025” plan, for instance, sets out to use subsidies and protection to create world leaders in ten industries, including aviation, tech and energy, which together cover nearly 40% of its manufacturing. Although China has become less blatant about industrial espionage, Western companies still complain of state-sponsored raids on their intellectual property. Meanwhile, foreign businesses are profitable but miserable, because commerce always seems to be on China’s terms. American credit-card firms, for example, were let in only after payments had shifted to mobile phones. China embraces some Western rules, but also seems to be drafting a parallel system of its own. Take the Belt and Road Initiative, which promises to invest over $1tn in markets abroad, ultimately dwarfing the Marshall plan. This is partly a scheme to develop China’s troubled west, but it also creates a Chinese-funded web of influence that includes pretty much any country willing to sign up. The initiative asks countries to accept Chinese-based dispute-resolution. Should today’s Western norms frustrate Chinese ambition, this mechanism could become an alternative. And China uses business to confront its enemies. It seeks to punish firms directly, as when Mercedes-Benz, a German carmaker, was recently obliged to issue a grovelling apology after unthinkingly quoting the Dalai Lama online. It also punishes them for the behaviour of their governments. When the Philippines contested China’s claim to Scarborough Shoal in the South China Sea, China suddenly stopped buying its bananas, supposedly for health reasons. As China’s economic clout grows, so could this sort of pressure. This “sharp power” in commerce is a complement to the hard power of armed force. Here, China behaves as a regional superpower bent on driving America out of East Asia. As with Scarborough Shoal, China has seized and built on a number of reefs and islets. The pace of Chinese military modernisation and investment is raising doubts about America’s long-run commitment to retain its dominance in the region. The PLA still could not defeat America in a fight, but power is about resolve as well as strength. 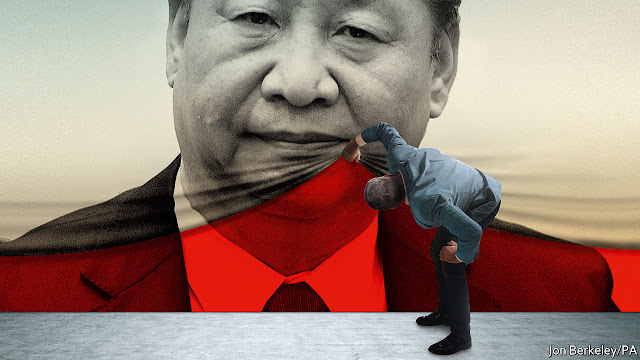 Even as China’s challenge has become overt, America has been unwilling or unable to stop it. What to do? The West has lost its bet on China, just when its own democracies are suffering a crisis of confidence. President Donald Trump saw the Chinese threat early but he conceives of it chiefly in terms of the bilateral trade deficit, which is not in itself a threat. A trade war would undermine the very norms he should be protecting and harm America’s allies just when they need unity in the face of Chinese bullying. And, however much Mr Trump protests, his promise to “Make America Great Again” smacks of a retreat into unilateralism that can only strengthen China’s hand. Instead Mr Trump needs to recast the range of China policy. China and the West will have to learn to live with their differences. Putting up with misbehaviour today in the hope that engagement will make China better tomorrow does not make sense. The longer the West grudgingly accommodates China’s abuses, the more dangerous it will be to challenge them later. In every sphere, therefore, policy needs to be harder edged, even as the West cleaves to the values it claims are universal. To counter China’s sharp power, Western societies should seek to shed light on links between independent foundations, even student groups, and the Chinese state. To counter China’s misuse of economic power, the West should scrutinise investments by state-owned companies and, with sensitive technologies, by Chinese companies of any kind. It should bolster institutions that defend the order it is trying to preserve. For months America has blocked the appointment of officials at the WTO. Mr Trump should demonstrate his commitment to America’s allies by reconsidering membership of the Trans-Pacific Partnership, as he has hinted. To counter China’s hard power, America needs to invest in new weapons systems and, most of all, ensure that it draws closer to its allies—who, witnessing China’s resolve, will naturally look to America. Rivalry between the reigning and rising superpowers need not lead to war. But Mr Xi’s thirst for power has raised the chance of devastating instability. He may one day try to claim glory by retaking Taiwan. And recall that China first limited the term of its leaders so that it would never again have to live through the chaos and crimes of Mao’s one-man rule. A powerful, yet fragile, dictatorship is not where the West’s China bet was supposed to lead. But that is where it has ended up. LAHORE – The Communist Party of China’s (CPC) decision this week to eliminate presidential term limits seems to open the door for President Xi Jinping to be not just “Chairman of Everything,” but also “Chairman Forever.” The move has been met with dismay around the world, but it has also intensified an ongoing debate among China experts over whether the biggest threat to China is too much executive power, or too little. In fact, the post-1979 dispensation has often allowed for a genuine battle of ideas, particularly between the statist Young Communist League and coastal elites who favor more economic liberalization. China may remain a closed society in many ways, but its top policymakers have shown an open-minded willingness to experiment and learn through trial and error. Many economists, meanwhile, are less worried about excessive executive power, because they think it is even more dangerous to have a government that is too weak to overhaul the country’s economic model when needed. Among the government’s current economic challenges are slower growth, spiraling debt – particularly among state-owned enterprises – and vested interests standing in the way of structural reforms. 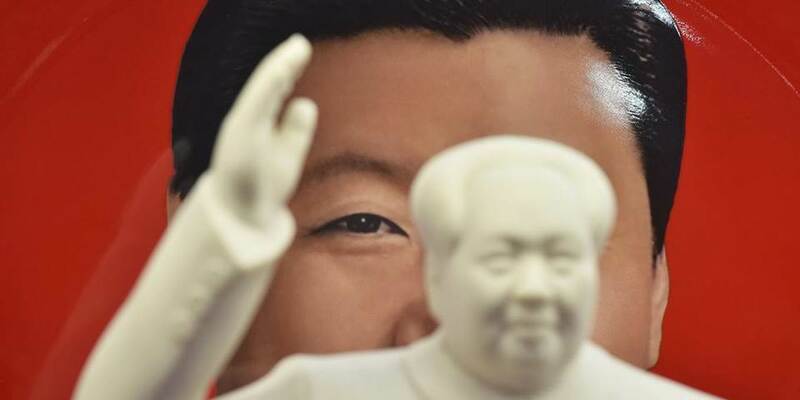 By contrast, argue the economists, Xi has begun to turn things around by fighting for a “cleaner party.” His massive anti-corruption campaign has jailed thousands of party officials at all levels, and reestablished the CPC’s grassroots credentials. The economists would concede that Xi’s campaign has also conveniently removed many of his potential rivals. But they would argue that his strengthened position now allows him to replace a growth model based on credit-financed debt with something more sustainable. This is where the technologists come in, by offering new ways to correct or avoid potential mistakes. In addition to supplanting the collective leadership model with one centered on the personality of a supreme leader, Xi has also significantly expanded the surveillance state. The government is increasingly using CCTV, big data, and artificial intelligence to study Chinese citizens’ behaviors, hopes, fears, and faces, so that it can forestall dissidence and challenges to its authority. Moreover, under Xi, the government has established online “social credit” databases, which suggests that it could eventually roll out a single score for all Chinese citizens, comprising credit ratings, online behavior, health records, expressions of party loyalty, and other information. The beauty of a big-data dictatorship is that it could sustain itself less through direct threats and punishment as a public spectacle, and more through “nudges” to manipulate people’s perspectives and behavior. And the more time Chinese citizens spend online, the more the government will be able to control what they see and do there. If there is one thing that political scientists, economists, and technologists can all agree on, it is that Xi is building the most powerful and intrusive surveillance regime in history. It remains to be seen if his approach to “making China great again” will strengthen his hand or turn out to be a fatal weakness. But with China playing an ever-larger role in the global economy through its investments and infrastructure projects, the reverberations from what happens there will be felt everywhere, and for years to come. In a sense, Xi might just end up being a “chairman of everything forever” after all. Donald Trump is right about North Korea, of course. It never made sense for the US to launch a “bloody nose” military strike against Kim Jong Un’s isolated country without having tried diplomacy first. America and North Korea were on a collision course to war. A unilateral US attack, which had been considered seriously in Washington for months, would have brought with it incalculable risks. The powerful North Korean military would probably have struck back. China might have intervened to defend its border, producing a potential stand-off between Beijing and Washington. US military leaders predicted such a clash would cause tens of thousands of casualties in both South and North Korea. It could have been catastrophic for Mr Trump to choose war before talks on a bitterly divided Korean peninsula. Sitting US presidents and North Korean leaders have not spoken in seven decades. The only American known to have met Mr Kim is the retired basketball star Dennis Rodman, an athlete of considerable merit but decidedly not the person to negotiate the future of a nuclear crisis. However abruptly Mr Trump has cast aside decades of American policy and his own opposition to talks, he has chosen the wiser path for his country and the world. Better he meet Mr Kim in an extraordinary summit than march off blindly to war. Still, the devil for Mr Trump will be in the detail. As he contemplates what could be the greatest challenge of his presidency, there is much to give him pause. He must first recognise Mr Kim’s strong position. North Korea has a considerable nuclear arsenal and has made impressive progress in missile tests. Mr Kim will negotiate but continue working behind the scenes to achieve his goal of an intercontinental nuclear missile that can reach any target in America. Mr Trump should also realise that the North Korean leader has no intention of trading his nuclear programme for peace. Mr Kim considers his nuclear force as the ultimate guarantor of his regime’s security. Even if Mr Trump could convince him to denuclearise, verifying compliance would be difficult. Could Mr Kim be trusted to keep his word? His father forged but violated agreements with previous US presidents Bill Clinton and George W Bush. Mr Kim seeks legitimacy from the talks and ultimately world recognition as a nuclear power. The US president’s second challenge is to prepare for his daunting summit with a very thin bench of Korea and east Asia experts in Washington. This is a problem of his own making. He has yet to appoint a US ambassador to Seoul or an assistant secretary of state for east Asia. His draconian budget cuts at the Department of State and open disregard for diplomacy have produced an alarming exodus of senior career diplomats. To counter Mr Kim’s strengths, Mr Trump needs to commit himself to an aggressive diplomatic campaign. He should consider delaying the meeting until he has orchestrated a coalition with South Korea, Japan and China to intimidate Mr Kim. Global sanctions against Pyongyang must remain. China’s president Xi Jinping should be asked to warn Mr Kim of the risk of a diplomatic failure. Mr Trump needs to cancel steel and aluminium sanctions against his most vital ally in the talks — South Korea. Rex Tillerson, secretary of state, should conduct preliminary discussions to confirm Mr Kim’s seriousness. What Mr Trump does now to strengthen his position may be as important as what happens at the talks themselves. The US president’s surprising turn to diplomacy is a gamble. He will need to be uncharacteristically deliberate and serious in preparing for the summit. The probability of success is not high. In choosing a diplomatic path, however, Mr Trump keeps alive the prospect that discussions with Mr Kim might yet prevent a major conflagration in Asia. That alone will make these talks worthwhile. THE second presidency of Sebastián Piñera, a billionaire businessman turned politician, will begin on March 11th in seemingly auspicious circumstances. Mr Piñera won a resounding victory in a run-off election in December, with 55% of the vote. Chile’s economy is growing at its fastest rate for two years and the price of copper, its main export, is rising. The 11-country Trans-Pacific Partnership, a trade deal from which Donald Trump opted out, is due to be signed in Santiago on March 8th. And a Chilean film has just won an Oscar. Yet the sunny appearance may deceive. Mr Piñera, who was a successful but unpopular president of the centre-right in 2010-14, must deal with the conflicting pressures of restoring rapid economic growth by boosting private investment while trying to meet the demands of a society undergoing far-reaching change. For two decades after the end of Augusto Pinochet’s dictatorship in 1990, Chile offered a successful model of an open, free-market economy and gradual social reform under centre-left governments. Chileans became less poor, and millions of people went to university for the first time. Mr Piñera continued this approach. The economy boomed on his watch. But faced with a powerful student movement angry over the cost of higher education, he struggled politically. His successor (and predecessor), Michelle Bachelet, swung to the left, adopting the students’ demands. When one of her allies promised to take a retroexcavadora (the graphic Spanish word for a backhoe loader) to Pinochet’s “neoliberal model” under which many public services are privately provided, she did not contradict him. Ms Bachelet pushed through reforms of tax, education and labour, all aimed at making society less unequal. To achieve this, she abandoned the consensual approach of her predecessors. However laudable her intentions, many of her reforms were polarising, technically flawed and unpopular. Business took fright. Investment has fallen for the past five years. The economy averaged growth of just 1.8% a year under Ms Bachelet, compared with 5.3% under Mr Piñera. Her people blame low copper prices; her critics blame her reforms. It was Mr Piñera’s economic record, and fear that Ms Bachelet’s candidate would tack even further left, that brought him victory. His main aim is to restore economic growth to 3.5-4% a year, the most the economy can now manage, says Felipe Larraín, who will be finance minister (as he was in 2010-14). A key measure will be improving Ms Bachelet’s hugely complicated tax reform and gradually cutting the corporate income-tax rate from 27%, among the highest in Latin America. “We want to build on what we have,” says Mr Larraín. “There will be no retroexcavadora.” The new president could not demolish Ms Bachelet’s legacy if he wanted to. Unlike her, he will lack a majority in congress and will have to woo the Christian Democrats, centrists who belonged to Ms Bachelet’s coalition. She promised universal free higher education and banned top-up fees and profits in privately run but publicly financed schools. Mr Piñera is likely to tweak rather than scrap these changes. Free higher education would cost 3% of GDP. “We don’t have that money, we’re not Norway,” says Mr Larraín, who inherits a much weaker fiscal situation than he left. The new government will focus on making most technical education free and allowing limited top-up fees and selection in schools. It also promises to put more public money into health care and the privately managed pension system. Chile needs better schooling and worker training to raise productivity, diversify the economy and reduce inequality. The question facing Mr Piñera is whether he can sell his policies politically. 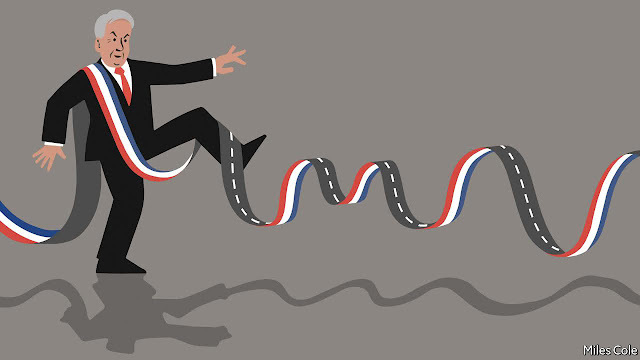 Chile’s success has made the country harder to govern. The student movement has waned, but not much. Unions were empowered by Ms Bachelet’s labour reform. Her electoral reform has made congress more proportional, but weakened the stable two-coalition system of post-1990 politics. A new far-left group, akin to Spain’s Podemos, won 20 of the 155 seats in the lower house of congress. In his first government Mr Piñera often seemed to Chileans more the businessman—arrogant, impatient, unempathetic—who understood investors than the politician who cared about ordinary people. One source close to him insists he has mellowed. Some of his cabinet appointments look odd. He has placed Alfredo Moreno, a fellow tycoon, in charge of the social-development ministry, for example. But his team includes a core of experienced politicians. He will need them. 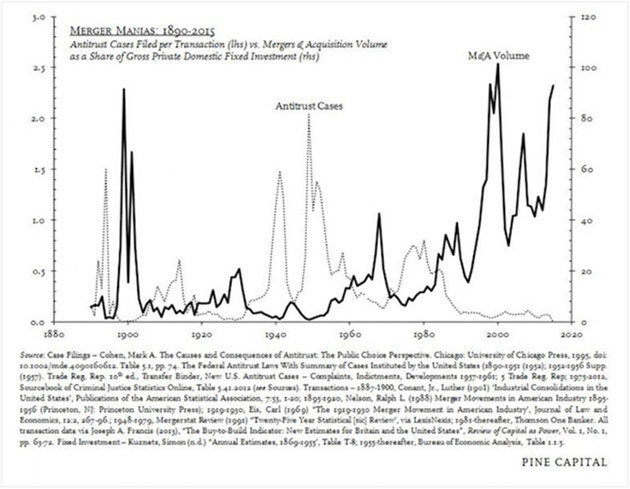 If Paul Tudor Jones had a choice between holding US government debt or a hot burning coal in his hand, the legendary hedge fund manager would choose the coal. “At least that way I would only lose my hand,” he told clients in his latest investment letter. He is not alone. The 10-year Treasury yield has climbed from about 2 per cent a year ago to over 2.9 per cent, causing several high-profile investors to declare the end of the 30-year bond bull market. A robust US economy is gaining further stimulus from sweeping tax cuts and an expansionary budget, which some analysts fear will finally ignite inflationary pressures. Moreover, tax cuts will swell the budget deficit from about 3.9 per cent of gross domestic product last year to about 6.1 per cent in 2020, according to the Congressional Budget Office. At the same time, the Federal Reserve is trimming its balance sheet, so investors will soon have to absorb $1tn of Treasuries a year. Nonetheless, there are ferociously strong, longer-term phenomena that are still subduing inflation, interest rates and bond yields. A recent paper by the Bank of Japan offers some useful clues on one of the most under-appreciated factors: demographics. The world is getting older and richer. That saps economies of their vim and helps quell inflationary pressures — as pensioners tend not to be big spenders — and increases demand for the safety of government bonds. The paper, written by Nao Sudo and Yasutaka Takizuka in the BoJ’s monetary affairs department, estimates that Japan’s ageing demographics and resulting “savings glut” account for about 2.7 percentage points of the 6.4 percentage points decline in inflation-adjusted interest rates over the past five decades. The study is a valuable contribution to the swelling body of research on the subject, both because of its exhaustiveness and because Japan is arguably the demographic canary in the coal mine. Although every major country is turning greyer, Japan’s average age is comfortably the highest in the world. Some analysts have worried that as pensioners grow even older, and start actually drawing down their savings in the twilight of their life, it will reverse the long-term downward pressure on interest rates. Barclays has in the past estimated that this will raise interest rates by about 2.25 percentage points just over the next decade. But the BoJ paper argues those concerns are overdone, primarily due to two factors. Firstly, the coming demographic changes are much more moderate than the shift of the preceding fifty years. Secondly, the BoJ researchers argue that since the rise in longevity is permanent, it has spurred a permanent change in saving behaviour and therefore interest rates. They estimate that coming demographic trends will raise rates by less than 1 percentage point by 2060. Of course, estimating phenomena like “natural” real interest rates — the steady-state level where they neither stimulate nor depress growth — is the economic equivalent of the Higgs boson in physics, a particle that probably exists but can only be vaguely detected from its impact on other more measurable factors. But markets seem to agree that while bond yields might rise in the short term because of cyclical factors like faster growth, inflation and debt issuance, the longer-term outlook remains largely unchanged. The US 10-year, 10-year forward, essentially what investors think the 10-year Treasury yield will be in a decade’s time, has declined from nearly 8 per cent in the mid-1990s to just over 3 per cent. Inflation swaps and inflation-proofed bonds also indicate that investors think prices will stay muted for a long time to come. Another new paper, by three academics at New York University, offer up another intriguing argument for why bond yields are so low, and why they will stay subdued for the foreseeable future. They posit that the financial crisis was such a large shock that it has led to a broad-based reassessment on the likelihood of market calamities. In other words, before the crisis events of such severity were considered nearly impossible, but since then investors have had to embed worst-case scenarios into their risk assessments, leading to more durable demand for the safest government debt. As Yogi Berra quipped, in theory there is no difference between theory and practice, but in practice there is. Economists might be getting the dangers lurking in bond markets horribly wrong. But for all the current angst, Mr Jones should probably still choose US government debt over a hot piece of coal. (Bloomberg) – Federal Reserve Chairman Jerome Powell and his colleagues may be willing to accept inflation rising as high as 2.5 percent as they seek to extend the almost nine-year economic expansion. So say a number of veteran Fed watchers who argue that the central bank’s Federal Open Market Committee would tolerate a moderate rise in inflation above its 2 percent goal after years of falling below that objective. Powell delivers his first testimony to Congress as Fed chief on Feb. 27 and March 1. “I’ve had some hawks on the committee surprise me and say they wouldn’t be worried about a modest overshoot” as long as it’s below 2.5 percent, former Fed governor Laurence Meyer said, without identifying who those anti-inflation stalwarts were. Inflation currently is 1.7 percent. That suggests investors’ fears that U.S. central bankers will react aggressively to signs of stirring price pressures are misplaced. Meyer, who now heads consultants Monetary Policy Analytics in Washington, does see the Fed raising interest rates four times this year — one more than policy makers projected in December — but said that’s likely the limit. “Two and a quarter percent inflation isn’t going to scare anybody” at the Fed, said Roberto Perli, a partner at Cornerstone Macro LLC in Washington, who sees three rate hikes this year. “Two and a half percent is kind of the boundary,” the former Fed economist added. Some Fed officials have already voiced a willingness to see inflation rise above their objective. Speaking at Bloomberg Business event on Feb. 21, Minneapolis Fed President Neel Kashkari suggested that the central bank should tolerate above-target price rises for a while. “We’ve been around 1.5 percent inflation for the last five or six years,” he told Bloomberg Television’s Michael McKee after the event. “If we really are serious about a symmetric 2 percent target then we should be equally comfortable — or uncomfortable — with 2.5 percent inflation for the next five years. While it’s likely that others will see it differently — Kashkari is, after all, one of the Fed’s most dovish members — the central bank has signaled a willingness in the past to allow inflation to rise to 2.5 percent. Of course, the Fed’s tolerance for above-target inflation will depend on what else is going in the economy and financial markets. A lot will also depend on what happens to inflation expectations, according to Mark Zandi, chief economist at Moody’s Analytics Inc.
Investors currently expect average annual increases in the consumer-price index of 2.1 percent over the next 10 years, based on trading in the bond market. That’s up from last year’s low of 1.67 percent set in June. St. Louis Fed President James Bullard called the rise in inflation expectations a “welcome development” on Monday at a National Association for Business Economics conference in Washington. It’s absolutely to be expected that the Fed responds to market instability with something. Starting in the mid-1990s that’s been the standing policy. When a developing country defaults the Fed cuts rates and guarantees bank loans. When a hedge fund implodes, the Fed cuts rates and engineers a bailout. When the housing bubble bursts the Fed cuts rates to zero and dumps $4+ trillion into the banking system. So now we know that when the stock market “corrects,” that is, falls by 10%, the Fed will up its inflation target, offering easier-than-expected money to re-ignite the buy-the-dip animal spirits of speculators and individual margin buyers. If this doesn’t work, the pace of rate increases will be scaled back. If that doesn’t work QE will return on an even bigger scale, followed by the direct purchase of equities by the Fed, ECB and BoJ. We also know that these guys, to use Jim Rickards’ turn of phrase, “think they’re working a thermostat when they really have a nuclear reactor.” The former can be adjusted up and down in a linear fashion while the latter will go critical if taken beyond a certain point. Which is how inflation expectations work. Once a society realizes that its government is aggressively devaluing the currency they give up on it, converting available cash to real things, which sends prices soaring and the currency plunging. The Fed, in its desperation to elevate asset prices, seems intent on discovering where that point is.